Over the course of first 10 seasons, 11 different teams have taken part in the Indian Premier League at some stage and Chennai Superb Kings are the most successful franchise having won the competition three times. Mumbai Indians and Kolkata Knight Riders are the other two teams with 2 titles each. Rajasthan Royals (suspended for two years after 2015 season) and Deccan Charges has won the competition once each. 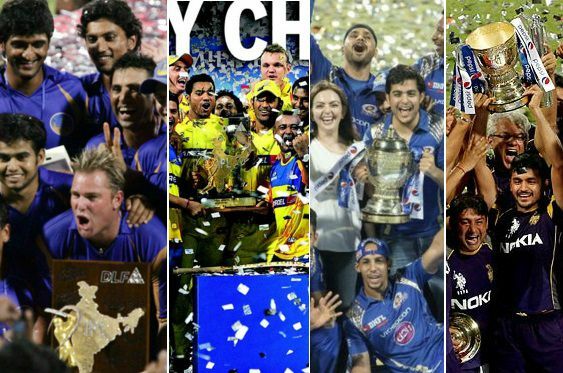 Today we take a look at all the past winners and how they won it plus all-time IPL win/loss ratio of all teams from 2008 to 2018. Most Successful IPL team ? : Chennai, Mumbai and Kolkata has won the competition two times each but its Chennai Super Kings who has been the most consistent team having played 7 of the 10 finals held so far. Thats some achievements considering there is a “spending cap” in the IPL. Chennai Super Kings under MS Dhoni has qualified for the IPL final record 6 times but only won the competition twice, lost four finals. Mumbai has reached the final three times, winning twice and losing once. Fixed match by rps, if Dhoni stays, 100% RPS will win then.. I think’ at last over 2nd and 3rd ball will be wicket at main wicket and that was true but not problem fan of msd because next the kings ? back to be fire. At next year chenai super kings back and i would be sepport this time. I think all msd fan would be sepport this team. i vote to the Mumbai indians where heros become champions.